This is like your own WaterPark in your back yard! Make sure you have room for this 40 FOOT LONG unit. Double Slides are back to back. You have a WaterSlide and a Tunnel Slide on each side. Four kids can slide on 4 different slides at once. Up to a 200 lb total weight limit on the inflated slides and 2 additional kids can slide on the tunnel slides. Max capacity 4 kids at 100lbs each. Includes oversized carry bag, stakes, hoses, and blower. 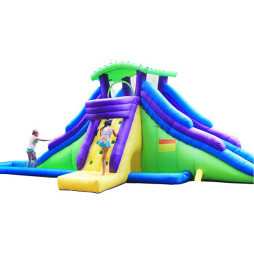 Get ready to Bounce, Climb, Play, and Slide all day in your very own CLUBHOUSE!! The Kidwise Clubhouse is packed with lots of activity based events. This unit is 16x16x9’ has 2 external slides and 1 internal slide. It has two climbing areas to get to each level, and a catwalk that can also be used as a ball pit area to navigate through. The bouncing area is approximately 6×8’. Tropical Wave with Monkey Hoops Waterslide. Had enough sliding? How bout a game of Monkey Hoops! This unit comes with a Double Slide and One Goal. Summer Blast Waterpark will insure your kids have a blast all summer long. This inflatable water park has a great layout with 3 water slides, a slippery tunnel, ball hoop, and huge pool area for just keeping cool. The inflated slides are suitable for 3 kids with a 300lb weight limit. But their is lot's of room for more kids in the pool and other activities. Playtime for the little ones! This Inflatable bouncer has a Slide and Ball Pit. Simply unfold and hook up the air-blower and play away. 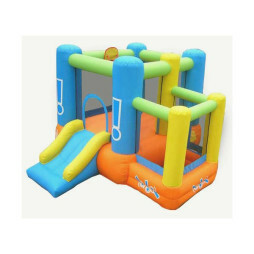 Perfect for the little one's who love to bounce. 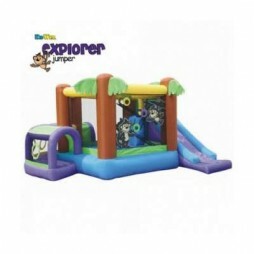 The Explorer Bouncer has activities that are perfect for kids who love to explore. You crawl through a tunnel to enter the bounce area. Play ball with the Monkeys in the Monkey Pit Bounce area, then Slide down the large slide to get back to the outside and do it all over again! This unit provides hours of constant fun for the little ones. The Arc Arena II Sport Bouncer is now ready for game time so let the games begin! KidWise is famous for its new and unique activity based bouncers. 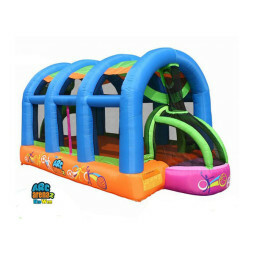 The Arc Arena II has a 10’x20’ overall dimension with lot’s of room inside to Bounce around and Play. The Celebration Bounce House is fun for celebrations year round! 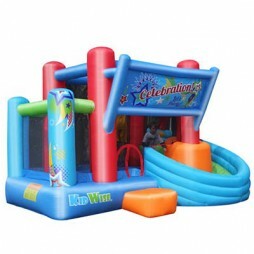 The party atmosphere of this bounce house is perfect for Birthdays and Holidays as well as every day fun. 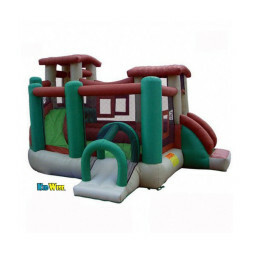 This bouncer has a separate play area that can be used for little ones that need their own space, or as a great place to play with pvc balls. 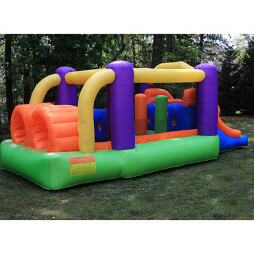 The Bounce Area is approximately 6×7 ft in addition to the ball play area. The Tower Slide is a unique design that allows kids to slide outside of the bouncer and crawl back in to the bounce area without having to leave the bouncer, thus keeping the bounce area clean and free from debris. 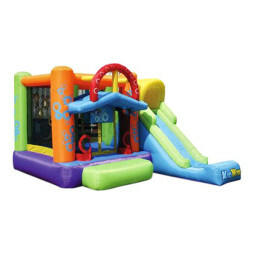 Provide your little ones with hours of jumping fun with this classic bounce house. 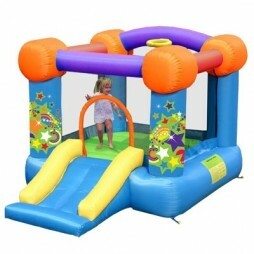 Featuring a bouncing area, slide and basketball hoop, the bouncer lets kids choose from a variety of fun activities. Crafted from durable nylon and vinyl materials, the play house is made for lasting indoor or outdoor use. The included blower inflates the house in just minutes so kids can start bouncing right away. 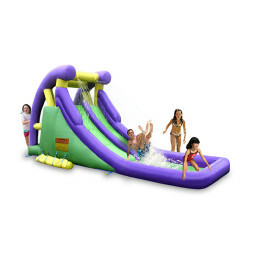 This Double Inflatable Water Slide is constructed for years of fun, enjoyed by the whole family. 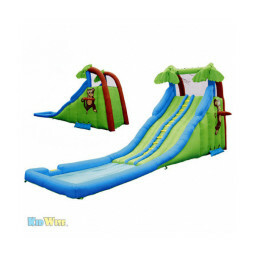 Simply hook up to your garden hose and you ve created a cascade of water that makes this super-sized slide doubly fun! Maximum capacity of 200 lbs. Included air blower plugs into any standard 120V outlet and makes for fast inflation. Recommend only 2 kids up to 100lbs each on the slide at a time. Comes with patch kit for minor repairs, carry bag, blower and stakes. 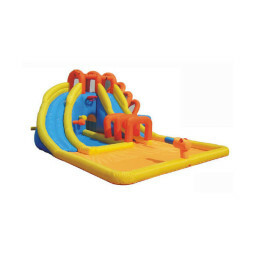 Obstacle Speed Racer Inflatable Bouncer promotes exercise, agility, and fun. Two kids at a time can race through the Obstacle and slide to a finish on the double inflatable slide. They can also play and bounce in the middle of the bounce area. Your kids will have hours of playtime and excersise on the Kidwise Obstacle Speed Racer. The inflated dimensions are 19 feet long x 9’w and 7’H. Made of 420D Oxford Nylon with PVC Backing.